Unfortunately I have no pictures available for this, as I had left my camera at school when I performed this. I'll try to be as detailed as possible. If you have any questions, you can IM me on AIM at Find4Path. If you run aftermarket stereo equipment or off-road lights, then you should definitely perform this mod. It is actually quite simple to do if you have a power drill and grinder. Air tools help A LOT! - 5/8" washers (total thickness about 1/4"
- Strap wrench or similar device to hold pulley in place while loosening/tightening. The first step to successful completion of this modification is to source a working Quest/Villager alternator. I found mine for $35 at a local junkyard. If you go this route, be sure you have it bench tested at 2 different places. 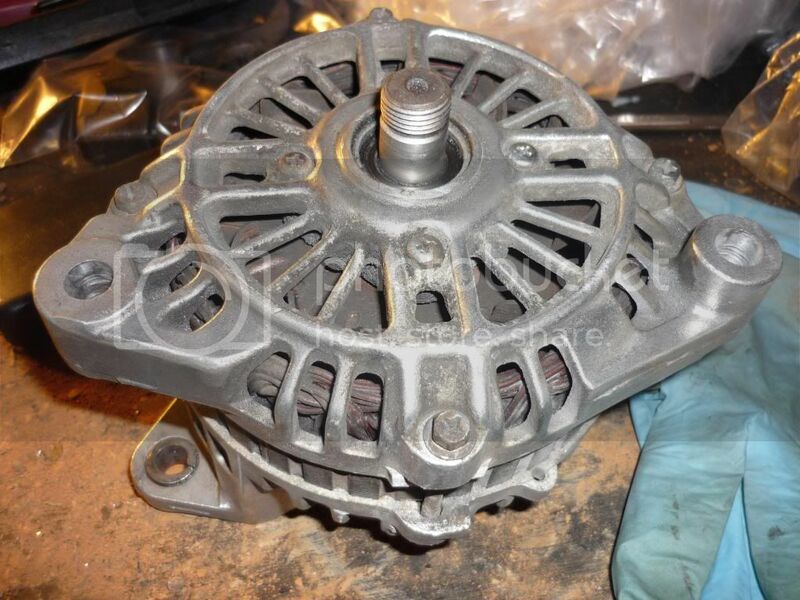 Most reputable junkyards will take back a non-working alternator that they sold as working, if you have documentation that it is not performing properly from bench testing. Secondly, before I dive into the steps, you need to be certain that you are capable of performing this operation. It was the single most physically painful job I have ever performed while working on any of my cars, and I've pulled motors and complete drivetrains without the help of a lift. 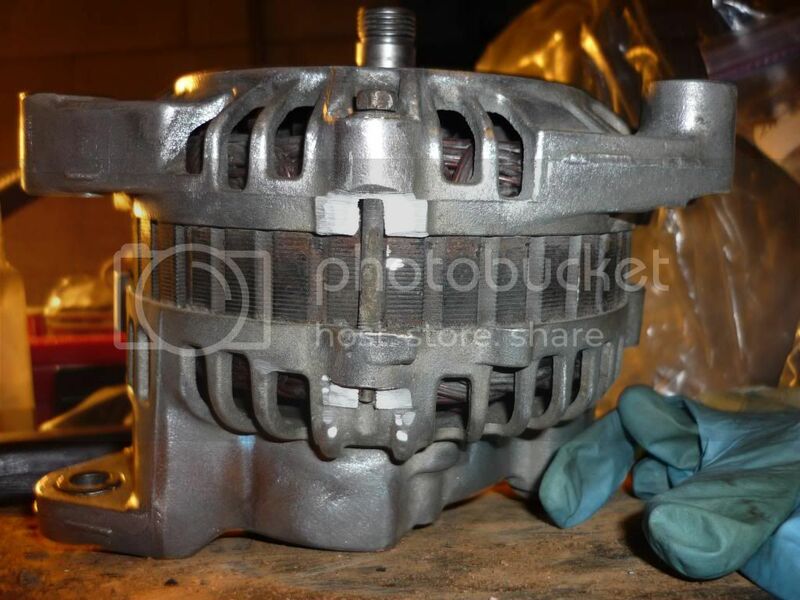 The alternator weighs upwards of 25-30lbs, so you need to be sure you can hold that weight steady for extended periods of time while attempting to line up the bolt holes. 1. Disconnect the battery ground. 2. Loosen the tension on the alternator belt by using the adjustment bolt for the idler pulley located to the right of the alternator. If you have access to air tools, you might want to use them for this step. The rotation on the adjustment bolt is opposite of what you would think. To loosen tension, "tighten" the bolt. This brings the idler/tensioner up and removes the tension in the belt. Once the belt is sufficiently loose, slide it off the pulley, while being careful not to damage it. The adjustment bolt is 12mm. 3. Disconnect all wires from the alternator. Be careful not to damage the plastic clip of the harness or the rubber boot on the output cable. You may need to spray PB on the ground wire screw to get it loose. I had to use Channel Lock Pliars to remove the screw, because my screw drivers stripped it. The nut holding the output wire on is 12mm. 4. Unbolt the bottom (long) bolt from the alternator housing. If you have access to air tools, you may want to use them for this step. The radiator hoses tend to get in the way, but you can push them off to the side while you unbolt it, however, be careful not to rip or puncture it. 5. Support the alternator from the side. 6. Unbolt the top bolt. The alternator will want to fall onto the crossmember and damage the pulley. If the pulley has the slightest knick in it, it can cause damage to your belt. 7. Once you get everything disconnected and unbolted, it is time to remove the alternator from the engine bay. However, I learned the hard way that this is easier said than done. If you rotate the alternator so the bolt tabs are closer to the motor, and pull it out pulley first through the gap by the battery, it'll wiggle out eventually. Don't be afriad to put some force on it, but be careful not to damage anything in the process. 8. 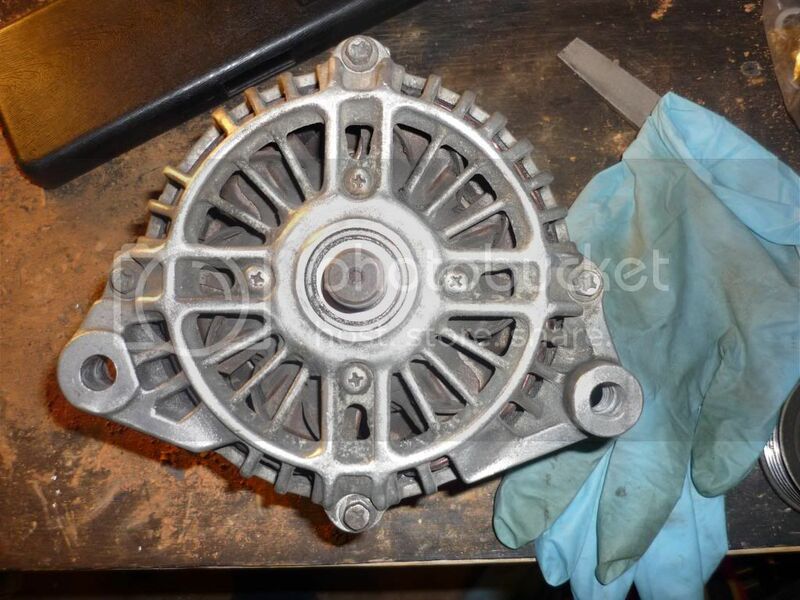 Now remove the pulley from the Pathfinder Alternator. You'll have to chuck it somehow so it doesn't rotate when you go to loosen the nut holding it on. Do the same on the Quest alternator. The Pathfinder pulley has 5 ridges, the Quest only has 4, so it will not work with the Pathfinder belt. The nut from the Pathfinder alternator will not work on the Quest, and the Pathfinder pulley is narrower at the base than the Quest. Slide the Pathfinder pulley onto the shaft, and slide the 5/8" washers on as well. You'll need enough washers to completely cover the shaft up to where the threads begin, otherwise the pulley will be loose. Hand tighten the Quest nut, and chuck the pulley. Then torque it down. 9. The prep work is almost complete. However, the holes for the bolts on the Quest alternator are not large enough to accomodate the bolts on the Pathfinder. You will have to drill them out using a 17/32" drill bit. However, be sure you cover the open vents on the alternator with duct tape before grinding or drilling on the alternator to avoid metal shavings/chips from entering and potentially damaging your alternator. 10. Once you get the holes reamed out, you'll have to grind down the tabs slightly so the bolts can sufficiently pass through them and have enough threads to hold the alternator in place. 11. Installation is the same as removal, but the Quest alternator is heavier and slightly larger than the Pathfinder alt. Also, be sure you tighten the hell out of the output wire nut, otherwise you'll run into the problem I ran into. You might want to pad your palm before doing this because you'll need to put some serious torque on it to get it to connect properly. Be sure you do not reconnect your battery until EVERYTHING is complete and properly connected, tightened. Did you remember to screw in the ground wire? I had failed to sufficiently tighten the nut on the output wire, and when I tried to start the truck, it would arc, and cause the failsafe to kill the electrical system. After a few seconds it would reset, and after numerous tries, I was ready to shoot something. Well, I realized that the nut wasn't as tight as it should be when I started tightening it with the battery connected (oh yeah, NEVER DO THAT), and it sparked like hell and shocked the living crap out of my arm. Have you ever had 14VDC shoot through a steel wrench into your arm? Yeah, it hurts. Also, when I had first swapped the pulleys, the Quest alternator rolled off my workbench onto the floor and bent the pulley. Be VERY VERY careful with the pulley as they are $76 from the dealer, and the dealer is the ONLY place that will sell you just the pulley. Be ready to have to use plenty of PB Oil if your truck has seen some life. Nissan likes to put all sorts of little sharp plastic clippies all over the engine bay in the most inopportune spots. I suggest you wear long sleeves and gloves to avoid painful, and often blood spilling injuries. I recieve more little cuts trying to get that damn alternator out than I have recieved in all my working on a car combined...well, except that time I kicked the windshield out of my VW Rabbit....but that's another story. Be extra careful when tightening down the output wire cable nut, as your wrench can easily slip off the nut and smash your hand firmly against the frame extension rail. I've got a nice black and red thumb and nail thanks to that one. Have plenty of light to work with. I suggest picking up a 500/1000W Work Light from Sears. They only run about $30-$40 and are absolutely invaluable for any garage or shadetree mechanic. Well, that's about it. If you have any questions feel free to IM me at Find4Path on AIM. Good luck with your swap. Thanks for all the how-to articles Dan. I hadn't even seen them until now. All the alternators I see for Nissan Quests fit models from 1993-1998 or 1999-2002, not 2000-2003? 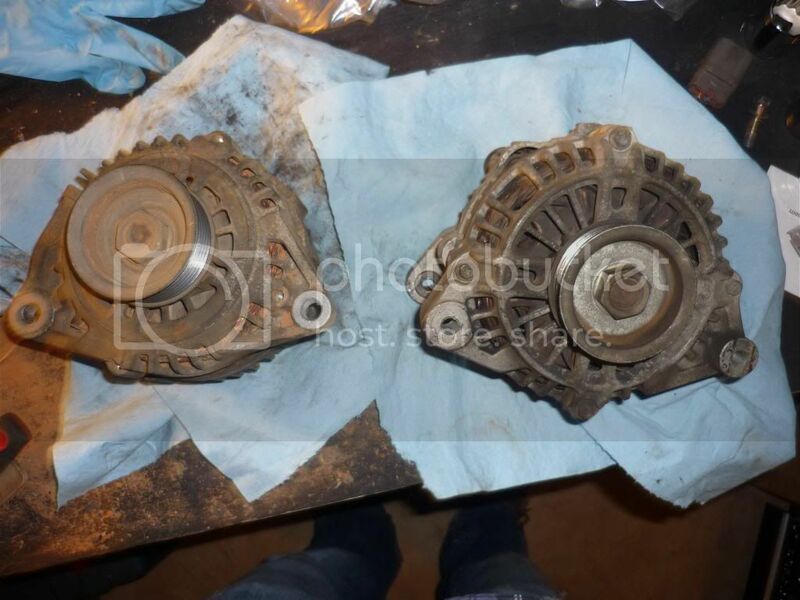 Is the 99-02 one the correct alternator? Thanks. I just did this install and had a few issues/tips that might help. 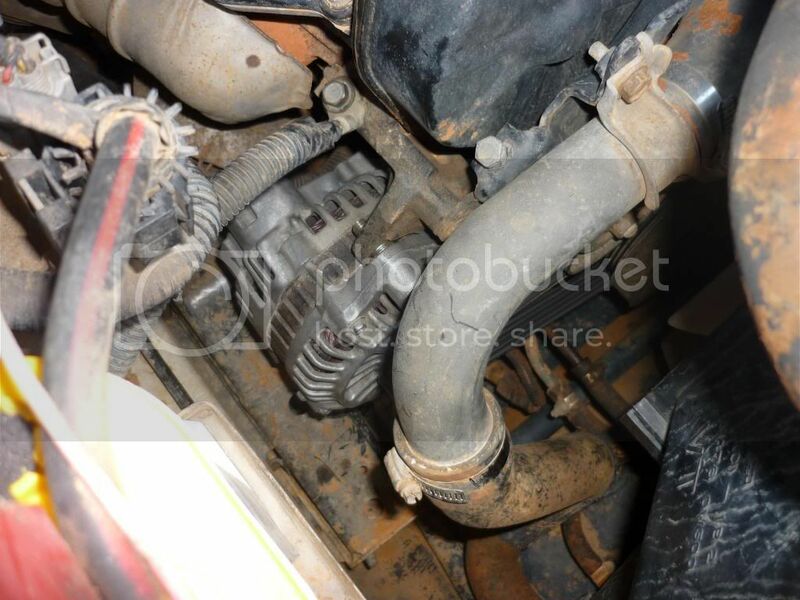 - For ease of installation, I highly recommend draining the radiator then removing the radiator hose that is directly in front of the alternator. I also removed the bottom hose for access from under. - I had to grind down the lip of the housing around the shaft right behind the pulley in order for the pulley to sit flush on the shaft and not sit on the lip. - Instead of grinding down the tabs on the Quest alternator you can get a longer bolt for the top from a hardware store (think it was an M10 x 1.5). For the bottom bolt, I found an alternator bolt kit at Advance auto parts that had a 3/8" bolt that is plenty long enough. Had to put a few extra washers on it to cover the unthreaded shaft before I put a nut on. Another good tip when swapping in a larger alternator, especially if the amperage is over 100 is to run a new 4 Gauge wire from the new alternator to the battery, you don't need to remove the stock wire as the power/current will take the path of least resistance, I was told this by Wrangler Power Products when I installed a 160 Amp Alternator in my hardbody that I bought from them. Quest alternator cleaned up with pulley removed and holes drilled to about 11 mm (10 mm bolts but I drilled 11 to allow for some slop). This shows how I had to grind the lip around the shaft down to allow for the pathy pulley to fit. This shows where the housing had to be ground down. Here it is installed. I had to use longer bolts than the normal alternator bolts and I had to use a few washers to fill space between the upper mount and alternator.